For the first time, researchers have experimentally observed light emission from individual graphene nanoribbons. They demonstrated that 7-atom-wide nanoribbons emit light at a high intensity that is comparable to bright light-emitting devices made from carbon nanotubes, and that the color can be tuned by adjusting the voltage. The findings may one day lead to the development of bright graphene-based light sources. The researchers, led by Deborah Prezzi at the CNR-Nanoscience Institute in Modena, Italy, and Guillaume Schull at the University of Strasbourg in France, have published a paper on their observations of the first electroluminescence from individual graphene nanoribbons in a recent issue of Nano Letters. "Generally, molecular-scale devices are interesting fundamental systems, but are rather unstable and produce limited amount of signal," Schull told Phys.org. "In our article, we prove that individual graphene nanoribbons may be used as intense, stable and controllable light sources. These are decisive steps towards real-world optoelectronic applications with nanoscale organic systems." Although graphene's excellent electronic properties have been investigated extensively, much less is known about its optical properties. One of the drawbacks of using graphene as a light-emitting device is that graphene sheets do not have an optical band gap. However, recent studies have shown that, when cut into thin ribbons just a few atoms wide, graphene obtains a sizable optical band gap, opening up the possibility of light emission. 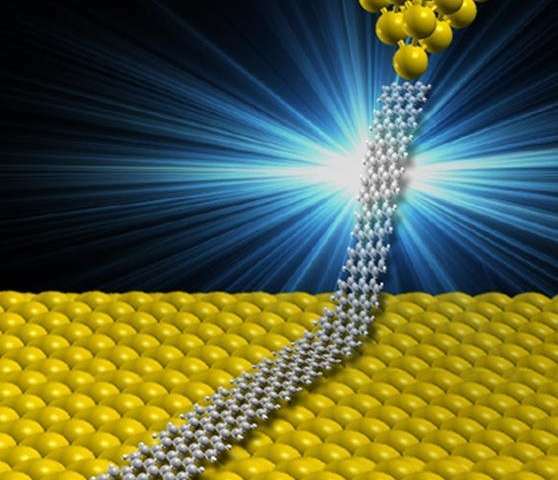 Experimentally, there have been only a few demonstrations of light emission from graphene nanoribbons, and these have been limited to ensembles of nanoribbons and revealed only weak light emission. So the results of the new study, which show a much brighter light emitted by individual graphene nanoribbons compared to ensembles, hint at the exciting untapped potential of graphene's optical properties. As the researchers explain in the new study, they used a novel configuration method in which an individual graphene nanoribbon bridges two metallic electrodes, for the first time forming an electronic circuit. Using a microscope tip, the researchers partially lifted the nanoribbon so that it lay partly on the substrate and partly suspended. This configuration reduces the coupling between the nanoribbon and the electrodes that would otherwise quench the light emission. Tests showed that the individual graphene nanoribbons exhibit an intense optical emission of up to 10 million photons per second, which is 100 times more intense than the emission measured for previous single-molecular optoelectronic devices, and comparable to that measured for bright light-emitting devices made of carbon nanotubes. In addition, the researchers found that the energy shift of the main peak changes as a function of the voltage, which provides a way to tune the color of the light. These observations also offer insight into the underlying mechanisms of the light emission from individual graphene nanoribbons, which the researchers plan to further investigate in the future. "We likely will explore the influence of the width of the graphene nanoribbons on the color of the emitted light, as the width is expected to control the size of the gap," Schull said. "The impact of defects should also be explored. Eventually, one should propose methods to integrate our graphene nanoribbons devices in larger circuitry."